NantHealth now offers Open Claim Status Inquiry (CSI) for our AllPayer Access and AllPayer Plus solutions. CSI lets provider offices access detailed claim status information for patients immediately and in real-time. By automating the delivery of receipt confirmation, adjudication status, and payment details, CSI users immediately receive the claim status they submitted for payment, freeing up cash flow, and eliminating lost productivity. Don’t delay accessing up-to-date status of your claims at any point during the payer adjudication cycle when you can find out with just a click. Choose the option that works best for you. 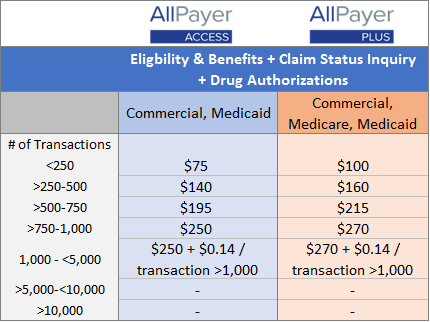 Pricing for AllPayer Access, and AllPayer Plus, is based on your monthly transaction volume, so you only pay for what you use. No long-term commitment is required. Enroll Now! Note: Provider office is billed based on actual activity in prior month. All major credit cards and automated clearinghouse (ACH) accepted as payment methods. To sign-up, complete this enrollment form and a NantHealth Representative will contact you for your payment information. If you have any questions, please give us a call at 1-800-721-8563 (Press 2 for Sales). Our office utilizes NaviNet daily for numerous functions including eligibility checks and claim status. This tool is truly helpful in our busy office! Our favorite feature is the access to multiple health insurance plans all in one place! This is super convenient and makes our job easier!